Standing, left to right – Lupe Diaz, Pastor of Grace Chapel Benson & President of the Benson Chamber of Commerce; Jeremy Barrett, ANPI President & General Manager; Norm Sturm, Jr., Cochise County Emergency Services Coordinator; Susan Pollock, retired as St. David Schools Counselor; Mark Goodman, Superintendent of St. David Schools; Bob Nilson, Director of Tourism, City of Benson; Carmen Miller, Neighbor, Rancher, and Owner of Arbor Solutions, LLC/The Tree Doctor. Members not shown are Sue Kartchner, St. David Community Supporter, Director of the St. David Heritage & Cultural Arts Society; Jim Mellentine, retired as owner of Harrington/Jade Trucking, and Wayne Merrill, retired as St. David Postmaster. Community progress, from within the community. 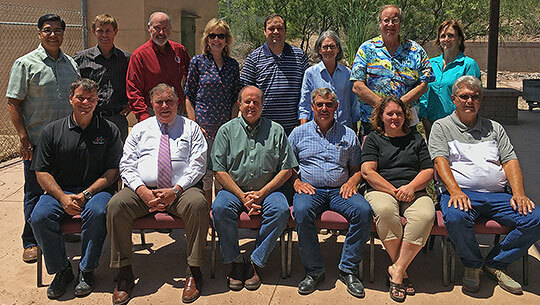 As an active, involved citizen of Cochise County and southeastern Arizona since 1920, Apache Nitrogen Products, Inc., has always been committed to helping the people and organizations in our area. Apache’s efforts support schools, charities, civic partnerships and many other groups. By encouraging the involvement of the people who live and work alongside us, we can collectively enhance the quality of our communities now and into the future.